Forget the pink leopard Mulberry for Target bag – it’s pink crocodile I am lusting after. This iconic Hermes Kelly bag in fuchsia is totally a “wish list” item, dream list perhaps with an almost $30k price tag but I like to look nonetheless. I stumbled across it at Bswank.com, a luxury resale website I like to ogle for covetable, if not (yet?) attainable, designer pieces. 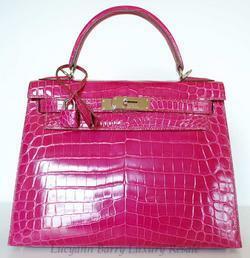 For the record, this divine Kelly bag is pink Nile crocodile with palladium hardware. The details state that the Nile crocodile is farmed in Zimbabwe and that gorgeous high gloss is achieved by buffing with stone. Hermes, the French luxury-goods house, introduced the bag in the 1930s but its popularity soared much later when in 1956 Princess Grace Kelly of Monaco was snapped carrying a large black crocodile Kelly bag, which she used to shield her pregnant tummy from paparazzi. After the image ran on the cover of Life Magazine, the bag became a hit and was later renamed the Kelly bag. “One of my clients has an incredible collection of amazing Hermes bags in all sorts of skins and colors and is consolidating her collection, hence I have several divine pieces on consignment,” says Lucyann Barry, the founder of Lucyann Barry Luxury Resale, in a sales blurb accompanying the bag. I am always fascinated that people have piles of these luxury pieces stashed away in grand closets, being the kind of gal who treasures her single vintage Chanel handbag and would be happy – satisfied even – to add maybe one more and call it a day.